Mist Eliminator and Coalescing filters are a cylindrical-shaped cartridge filter, designed to improve filtration and extend the service intervals of your industrial filter elements by removing entrained liquid and oil mist from air or gas pipelines and vents. 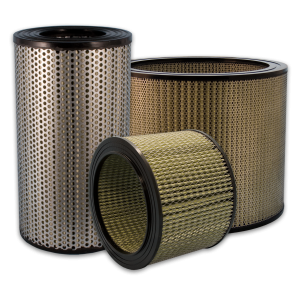 Coalescing and mist eliminator filters absorb oil mist, moisture, and vapor – separating liquid water and oil from compressed air using a coalescing effect. They also provide high-efficiency separation of oil mist and oil smoke from air or gas exhaust streams. Effective removal of visible oil, smoke, and mist from a rotary and mechanical vacuum pump discharge air and extend the life of equipment and improve the work environment by trapping oil mist and particulate, absorbing moisture, and preventing contaminants from progressing downstream. They also reduce amounts of airborne pollutants, helping manufacturing companies comply with health and safety guidelines. Sidco Mist eliminator filters are a high quality, cost-efficient alternative to OEM replacement filters.